Science and art come together in this fun contest! Share your work. Compete for prizes. Free! Description: Kids ages 3-17 spend time outside recording information about birds in their neighborhood or nearby park/refuge and collect observations in a scientific drawing with notes, like a page in a field guide (see example at the left, and below for suggested guided questions). Artwork will be featured at current and future SFBBO events as well as displayed on website and social media. The first 100 submissions will receive a free CuriOdyssey guest pass. Category and Merit awards will also be given. ​Contest Dates: Submissions due by Oct. 7, 2018. Winners will be announced in three age categories: ages 3-7 years (see modified guidelines), 8-11 years, and 12-17 years at the SFBBO Annual Membership Meeting on Oct. 20th, 2018, at the Jasper Ridge Biological Preserve in Woodside (attendance not required). Submission must depict both bird(s) and habitat that the artist has seen and visited (see example on above). Submission must be an original (not copied, traced, or duplicated from any existing art/photo) and be completed by the artist with no or minimal adult assistance. The artist can work off of a self-taken photograph. 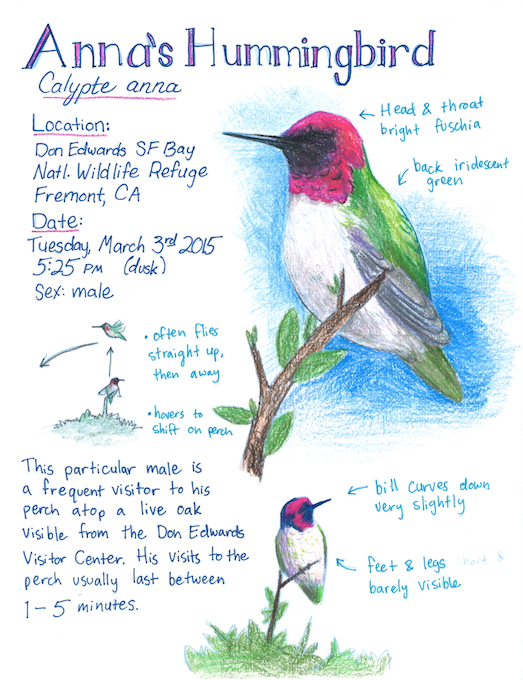 Submission must include both common and scientific bird name, date, observation notes, and artist name. Other possible items for inclusion: map, microscopic views, labeled parts, behavioral notes, season, etc. Submission must be an original work created in traditional media (pencil, crayon, watercolor, marker, etc.). Please NO prints, copies, or digital submissions. the image itself must fit within an 8 in x 10 in footprint. This is a great opportunity to get your young child started drawing and observing in the outdoors! These guidelines are similar to those for the other age groups but expressly encourage adult involvement in the process. Mentors (parents, teachers, guides) can help young children learn to ask questions that give them a chance to look closer at birds in nature and around them. Submission must depict bird(s) and habitat that the artist has seen and visited. Submission must be original (not copied, traced, or duplicated from any existing art/photo) and should be completed by the child as much as possible. Submission must be created on paper backing that is at least 8 ½ in x 11 in and the image itself must fit within an 8 in x 10 in footprint. How to Register: Please register by clicking on the "Register for the CFC" button at the bottom of this page; choose "Trips and Contests;" and click on the "CFC Kid Bird Art Contest" button. Registration is FREE! How to Submit Artwork: On back of artwork, please use pencil to legibly and clearly write artist name, age, hometown, and both artist and parent email (if applicable). Drop off or mail entries to arrive by October 7 to SFBBO, 524 Valley Way, Milpitas, CA 95035. Limit one entry per artist. All entries become the property of SFBBO and will not be returned. Entries may appear on the SFBBO website and social media, and at current and future events. Please contact us at 408-946-6548 ext. 2 or cfc@sfbbo.org with questions. These questions are intended to help artists (and mentors) work together to look and observe more closely. You don’t need to answer all of these questions to create a good field guide page, but the more questions you ask and wonder about, the more you will discover and see. Are there any patterns in bird’s movements? How did it move? Where did it move? Why does the bird choose where you see it? What do you think they might like about their chosen spot? Does the bird make any kind of noise (vocalization)? Can you describe or write out the song or noise? Does it remind you of anything?